All the useful information that you need to know before sending money with Travelex! Launched in the year 1976, Travelex has been set up to become the world’s leading foreign exchange specialist. It has been providing its services through various stores, bank transfers, ATMs, forward contracts, limit orders and one-off transfers. It has been specially designed to provide an international exchange to travellers across the world. Travelex offers live exchange rates to the customers, and they can also enjoy free transfer after a limit. The company provides low transfer fee rates comparing to many banks which charge in between $25 to $30 for a similar transaction. It has been providing customer care services to its customers in various countries which remains open in the stipulated business hours. It has been providing enough security to its website to protect the data of customers. It has been regulated under the General Data Protection Regulation 2016/679 (GDPR) for security. On these entire bases, we provide 7.5 out of 10 overall rating to Travelex. Pricing : How much does Travelex cost? Travelex offers the best prices for its customers and much lower than banks and other companies. It offers free transfer above $5,000 or similar amount in other currency. However, if the amount is lower than $5,000 than also the transfer fee is as lower as $5 or less depending upon the country and currency. One needs to transfer a minimum amount of $500 in every transaction which is a drawback because it’s a high minimum amount. Many other companies are often offering minimum transfer of $1 or similar amount in other currencies. Travelex rates are much better than many of the banks and highly competitive from many of its competitors. Whenever you write the amount for making an exchange, you’ll receive a display of the relevant live exchange rate. It will also allow you to calculate the amount of money that will arrive in your recipient’s bank account in their local currency. You will get the Travelex Money Exchange calculator here. So, we rate 7 out of 10 to Travelex pricing policy, because many other remittance service providers who offer transfer at a lower cost. Transparency: Does Travelex have any hidden fees? Travelex does not charge any hidden fees. Once you choose the currency you want to send and the currency of recipient, you will get the exchange rate as well as transfer fee on your screen. So, you need not to worry about the hidden fee while making transfers. One can track the transfer performed by them on their dashboard. You will get the delivery time and all other details there. If there is any delay in delivering the funds, you can also contact the company here: 877-414-6359 or [email protected] (in business hours). As we can see no hidden fee and good tracking procedure of the company, we rate it 8 out of 10, because assistance is not available 24/7. Transfer Speed: How long does it take to send money through Travelex? Travelex has been providing fast delivery in various countries it is covering through bank transfers or partners. The above table is just an indicative guide, for more information, one needs to open the account in Travelex, and then they will know how much time it will take in the transfer. So, the experts of Exchange Rate IQ is considering it fast enough to provide the funds to the recipient and rating it 8 out of 10. Security : Is Travelex Safe? The Standard Contractual Clauses that have been provided by the EU Commission. Treat in accordance with various notices and strict data protection standards. It has been providing ‘adequacy’ protections that have been defined and approved by the European Commission or the relevant Supervisory Authority. Travelex is not very much clear about the security it is using for saving the data online and in offline mode. So, Exchange Rate IQ’s experts provide it 6 out of 10 score in security head. Letter from a recognized public authority or public servant verifying the identity and residence of the customer to the satisfaction of the AP. It has also provided FAQs on its website, which one can consider for various questions they have regarding Travelex currency transfer. But if you have any other queries, you can contact Travelex customer care of your respective countries. You can also call the stores regarding any confusion in the transaction. Travelex offers cancellation to its customers through the call. You can call the store or customer care of the company for the cancellation of transfer. In its money card, one can be locked in the exchange rate and take advantage of favorable market conditions by opting the forward contract option. One can also schedule the regular transfer from Travelex, but it may get a delay until you choose the currency exchange rate for the transfer. So, Travelex International Money Transfer offers various modes of transferring the funds and also cash pick-up in few countries. You can start the transfer by Travelex login here. For looking after the transfer rates in app, you need to login or sign up in the app. While, you need not to do this in the Exchange Rate apps. So, as per user experience, we provide 8 out of 10 to Travelex and its services. 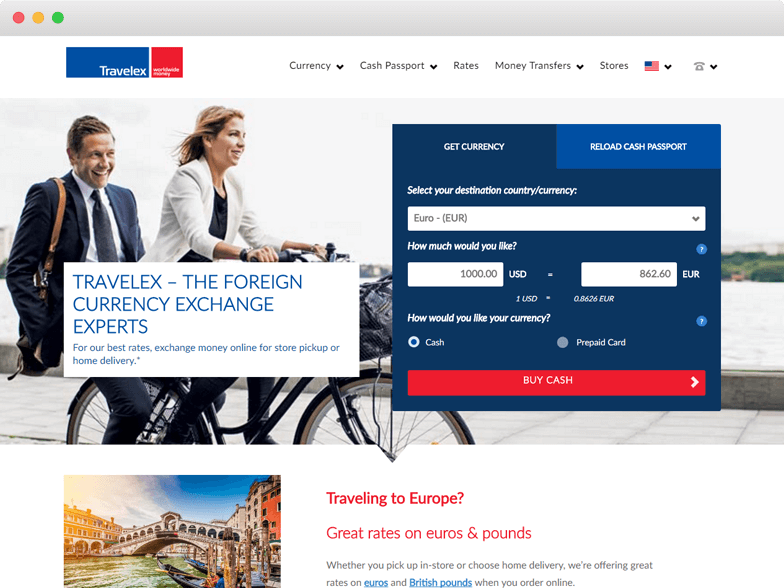 Coverage: How many Countries & Currencies does Travelex support? Customers can also use its online services and have over 1,500 stores as well as 1,250 ATMs worldwide. It has also been partnered with many banks, supermarkets and travel agencies. By joining hands with others, it has its reach to over 100 countries and 20,000 locations. Travelex has grown in various markets through new acquisitions. This includes FX Africa in South Africa and Grupo Confidence, the largest consumer foreign exchange specialist in Brazil. You can also find the store of Travelex near you here. Travelex has been covering so many parts of the world and also have its stores as well as ATMs. Still, it has to grow more to become the top money remittance company in the world. It provides specialized services for travelers such as money card and stores at airports. So, we rate 8 out of 10 to it for its coverage. I frequently recommend. Have never had any issue with obtaining or returning the foreign currency. Fast, Easy, Cost Effctive, Honest Exchange! Fast, fair, cost effective. I buy British Pounds for my family friend in the UK. I use it for the children's birthdays and holidays. I buy about once a year, and the transaction with Travelex is smooth! I actually tried to do an exchange through my local bank, but they said they were unable to get the specific money that I needed. I asked them what site they use and they said Travelex. That seemed strange since I knew Travelex did have it available. So I did the transaction on my own directly through Travelex and had no problems whatsoever. Our trip was awesome. Thanks! Travelex has a one-person booth in a nearby shopping mall. It's quick and convenient, unless you go when the staff is on lunch or dinner break. It was easy and very convenient at the airport. Great way to enhance any vacation!! We always use TravelexUS to get foreign currency for our trips overseas. It is easy to do on-line and their service is so reliable and fast. Would highly recommend!! My order was ready on time and the Travelex both was easy to find at the airport. It was quick and easy to exchange my currency. They were easy to find at the airport, and everything went very smoothly. Will definitely use then again when we go abroad. The service as very convenient and efficient. I felt more secure receiving my cash at home. I have and do recommend Travelex to anyone needing currency! Great service and nice people! I love that you can add multiple currencies to the one card. Great way to save for your vacation. Quite convenient and it worked. The experience was quite easy and the currency came quite quickly. Quite convenient and it worked. I did have some issues using my credit card and ended up using my debit card. Other than that I was pleased. Easy to use and order online. Easy to use and order online. Quick shipping and you can choose your date of delivery. Very convenient. Travelex was able to accommodate my last minute request which was great customer service! Ordered on line, received a great rate and picked up in a bank office a few days later. Purchased additional (different) currency at a discount. Go to the Travelex website. Click on “Send Money Internationally” at the top of home page. Click on “Get Started and Register” if you are new to the company, or just login. Enter all the personal details and banking details of your and recipient. Enter the amount that you want to send. You will get the live exchange rate in and the amount that recipient will receive. Re-check all the details of the recipient and confirm the transfer. You can track all the transfer details on your dashboard.